Labels allow you to tag transactions independently of categories. Use labels to easily see groups of related transactions across categories. Labels are an easy way to keep track of related transactions across different categories. 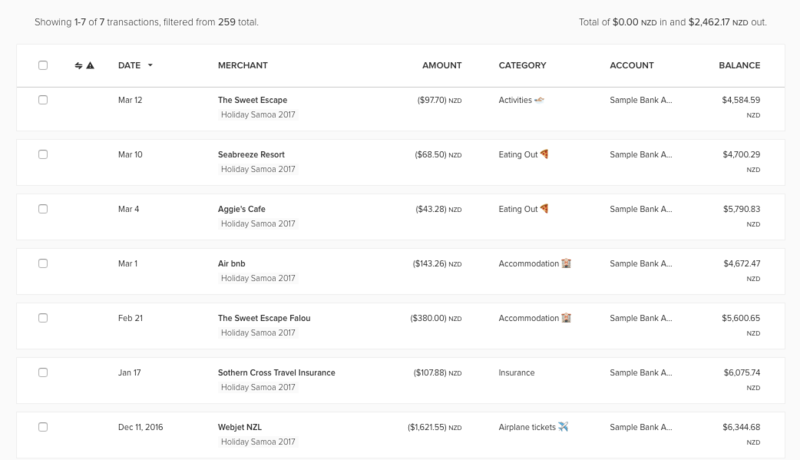 However, those same categories might also be used to categorize transactions unrelated to your holiday, making it hard to identify the total cost of the trip. This is where you can use labels to see similar transactions that fall into a number of different categories! If you label all of your transactions for your holiday to Samoa as "Holiday Samoa 2017". You will be able to easily to perform a transactions search to locate all of the expenses related to this holiday, as well as the total of the transactions. Create a saved search for each of your labels to make viewing your labeled transactions a breeze! See: Searching your transactions for detail on creating and using saved searches. You can also use labels to keep track of individual expenditure within a joint account. You may share a credit card with your partner for joint expenses, but sometimes, this may be used by either party for individual expenses, to be repaid at a later date. You can label any personal expenditure with the name of the person responsible for the transaction, and then add a paid label once this has been reimbursed. This means you can easily see whether there are any outstanding transactions that need to be paid back. You can assign labels to your transactions from the Transactions page - either add labels to multiple transactions at once or, add a label when editing a single transaction. You can have multiple labels for each transaction if you like! PocketSmith does not offer a specific label rename feature at the moment, however, you can replace labels by assigning a new one and then removing the orginal label from your transactions. 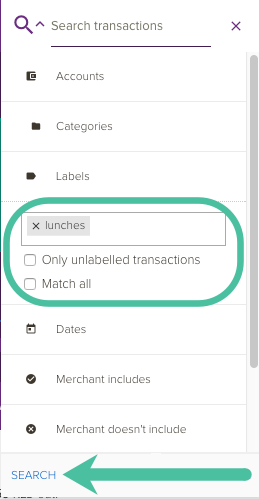 If a label is no longer assigned to any transactions, it will no longer show in the label selector. The example below demonstrates how to replace a 'lunches' label with 'eating out'. To delete a label, skip steps 4 & 5.